Pompey 3-0 Oxford: they said what? 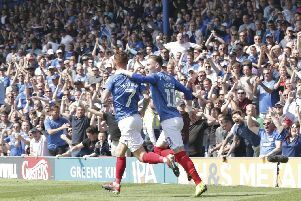 Pompey secured their first Fratton Park victory of 2018 with a 3-0 win over Oxford today. Two goals from Brett Pitman, plus Kal Naismith's first strike in four months, ensured they saw off the challenge of Oxford, who had Alex Mowatt sent off immediately after he missed a second-half penalty. 'I thought Oxford played really well up to the penalty and the red card. 'I thought we started very well and had more of the play in their half with chances and crosses. 'We were playing well but they came back strong. That was no coincidence with the players they've got. 'We were the better team here by a long way today. 'The set piece in the first half, take that away from the first five minutes, that's a very good performances against a good team. 'We dominated every aspect of the pitch, had the most chances and the most shots. Their keeper had probably more to do than our keeper and we're away from home. 'I thought the goal was a good start for us, it's always good to go a goal up early. 'But they probably came more into it then and had the better of the first half. 'They started very well the second half, obviously got the penalty, which looked a bit soft. 'Then the game is in our favour and it was good for Pits to get two tap-ins. 'We played a lot better then, but it's easier when the game opens up. 'I think Oxford lost a bit of heart when we got the second goal. 'A first home win in two months and 26 days has reignited Pompey’s play-off aspirations. 'Yet the crucial turning point was a missed second-half penalty by Alex Mowatt - and his subsequent sending off. 'The Blues, without manager Kenny Jackett in the dug-out, clung on at times before Mowatt saw red after slapping Nathan Thompson. 'What a refreshing afternoon as vibrancy returned to Fratton Park. 'A feelgood factor undoubtedly returned to town against Oxford United, as a first win at PO4 in 2018 was delivered. 'The scoreline didn't tell the story of the afternoon as the Blues weathered pressure before the game swung on Alex Mowatt's penalty miss and subsequent red card.